The Fourth » Who dwelleth in a pineapple under the sea? Who dwelleth in a pineapple under the sea? Tomorrow, the 21st, me and Victor have been together for four years. I wonder how many “X of the gods” objects there are? Something tells me the sponge isn’t the most ridiculous. He totally just found that in his bag right now didn’t he? Yeah, he always carries it around in case he comes across some dirty dishes. He’s a clean freak. Gotta be prepared. 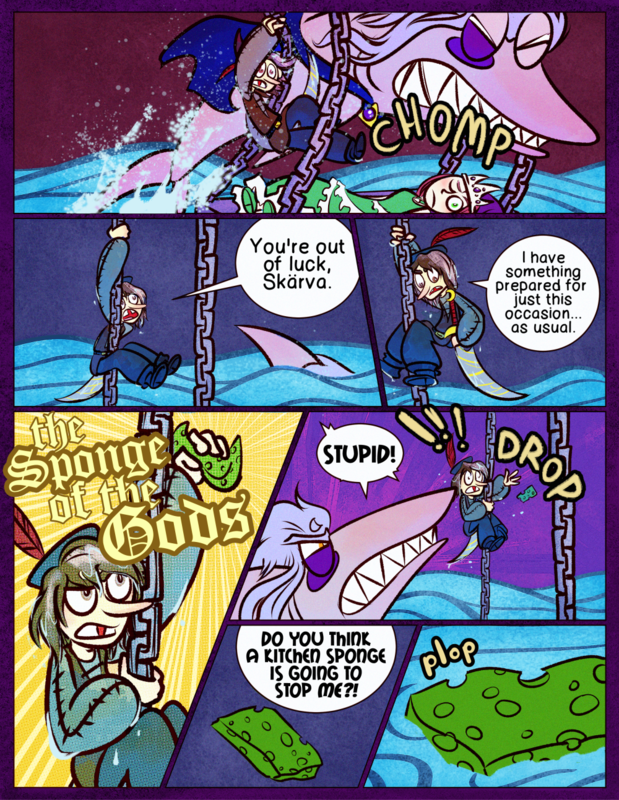 Really I am a bit surprised that Skarva thinks the sponge WON’T stop (or at least present a credible threat to) him. No, Skarva! Bad shark! Don’t scold, snarf! That monologuing thing will be the death of you. Of course, if he had eaten Blank, then that sponge would have landed in his innards. Eugh. Anyone for shark jerky? It’s organic! Congrats on the fourth year! I wounder what would happen if you put the sponge in the bucket? I would imagine an infinite loop of wetness.